Gum Recession. When patients experience gum recession (which can be caused by periodontal disease, genetics, or neglect) the root surfaces of teeth are exposed. This part of the tooth can be very sensitive to hot and cold temperatures, similar to a cavity. New Dental Work. Sometimes, when you’ve just recently had a cavity filling or other dental work, it will be sensitive for a while afterwards. This is reaction is normal and will usually correct itself. Contact us if you feel ongoing pain or sensitivity. Malocclusion. When teeth alignment is disrupted, opposing teeth may strike too hard or cause grinding. This usually happens because a missing tooth has not been replaced, and the surrounding teeth have drifted and shifted out of position. Bruxism (clenching or grinding). People with bruxism place extreme pressures on their teeth, sometimes without even being aware of the condition. It may happen during sleep, or subconsciously during the day. In either case, this habit can weaken tooth enamel and cause teeth to become hypersensitive. Always pay attention to what your body is telling you. 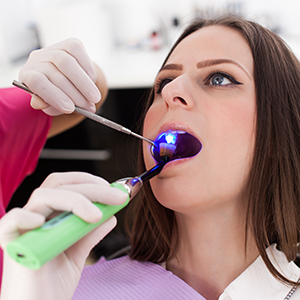 If you feel ongoing pain, sensitivity, or something unusual going on in your mouth, then contact us to find out the cause and learn the best way treat it!